Tours of the operating Easton Roller Mill have been scheduled since 2013 for the summer months, May through September, and usually held from 2 to 5 PM. For 2018, participants totaled 99, with some visitors on arranged tours. Tour dates for 2019 have not yet been set; please check this site later. Tours are announced in the Events sections of the Morgantown Dominion Post (Thursdays). The guided tours last about 30 minutes, and involve inspecting all of the mill facilities, including the mill power engine and the processing machinery used to provide milling services to the community. Usually an operator is available to run the engine and the roller mills. Tours are suitable for all ages, but children must be carefully supervised by accompanying adults. No rest room facilities are available at the mill. There is no charge for the tour, but donations are appreciated to help cover the costs of mill maintenance and operation. Special group tours may also be arranged. For more information call 304-594-2290. 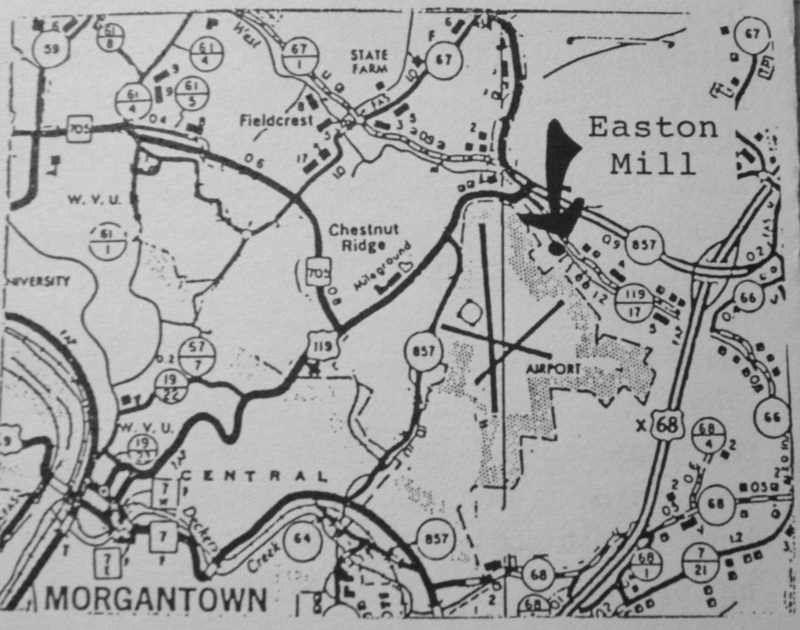 The mill is located near Morgantown, below the Mileground on Easton Mill Road, at the bottom of the Airport Hill, off of US Route 119 and WV 857. It is about 300 yards on the right, with gravel parking in front. © Monongalia Historical Society, 2019.